This guide will show you how to configure Snort to run inline using the NFQUEUE DAQ (referred to as NFQ). This allows your Snort server to use iptables to route traffic between any number of subnets, with Snort evaluating all traffic passing through the system. This guide will assume some knowledge of routing and IP addressing, especially as it is implemented under Linux, as well as some experience setting up Snort. Configuring Snort as an inline NIPS with NFQ is more complicated than setting snort up as a NIDS, and is more complicated than setting up Snort as a NIPS using the AFPACKET DAQ. The complexity is due to the use of iptables and the need to understand IP routing. I will assume that you have installed Snort before, so I may gloss over some concepts and explanations in this guide. If you find yourself having difficult with installing and configuring Snort, I recommend you first work through my complete guide on installing Snort which should give you a good foundation on understanding how to install and configure Snort. This guide has been written and tested on Ubuntu 16 x64. It should work on most currently supported versions of Ubuntu and Debian derivatives, but your mileage may vary. On Ubuntu, you can run Snort two different ways in inline mode, with AFPACKET or with NFQ. AFPACKET is simpler to setup (see my guide here), but only lets you bridge sets of paired interfaces. This means you can bridge eth0 with eth1 (pass traffic between them), and also bridge eth2 with eth3, but you can not pass traffic between eth0 and eth4. A benefit of AFPACKET is that you can install an inline Snort machine without any changes to IP addressing, routing, or networking changes. NFQ on the other hand lets you leverage the power of iptables to make routing decisions. It’s more complicated to setup (it requires you as a systems administrator to understand Linux routing), but is more powerful for network security. You can also use iptables to blottck traffic before Snort even sees it (to filter out noisy traffic sources), or use additional tools that interface with iptables to increase security (like psad or fwsnort). Enabling NFQ with IPv6 is very similar to IPv4, the only thing to note is that you will have to run a separate instance of Snort to process IPv6 packets, and setup another iptables rule to forward IPv6 packets to a second NFQUEUE using the ip6tables command. Essentially you follow this guide twice, once for IPv4, and once for IPv6, making changes as necessary. One thing to note: for simplicity, we will enable routing for all traffic passing through the system before we lock down the firewall rules. Because of this, I highly recommend that you test this on a development network to understand how it works before you implement on a production network. In a real environment, you would want your firewall rules in place before you enabled routing of traffic on a device that bridged networks with different security levels. For this guide, it’s much simpler to apply firewall rules at the end for the purpose of learning. I have noted a number of excellent online resources and books at the end of this guide to help understand networking, iptables, and network security. The 172.16.0.0/24 network is our internal admin or management network, and will not be routed by Snort. No traffic should pass between the 172.16.0.0 network and the other networks. This is how we will SSH into this snort system for management purposes, and if configured: Snort could send log data back to a logging server on this network. It is good practice to keep a separate network (through VLANS or separate hardware) for management purposes. We won’t lock down this network at first, but will apply firewall rules at the end of this article to prevent traffic from entering this network across our Snort router. The 10.0.0.0/24 network is our outbound network. All traffic not destined for a locally connected network will be directed out this network to the next hop gateway (in this case the ISP router). Note that the computer on this network has the Snort router as it’s default gateway. While this works, normally you’d configure the computer to have the actual external gateway (10.0.0.1 in this case) as the gateway. It’s set this way to simplify testing. The 192.168.0.0/24 network is our client network (screened subnet). Hosts will be configured on this network to use the Snort server as it’s gateway. Traffic passing between this network and the 10.0.0.0 network will be scanned by Snort, and will be dropped and/or logged if suspicious. Because this server is running Ubuntu 16, the interface names no longer follow the ethX standard (eth0, eth1, …). Instead, interfaces names are assigned as Predictable Network Interface Names. This means you need to check the names of your interfaces using ifconfig -a. In my case, what was originally eth0 is now ens160. Since you are using your Snort system as a router, you’ll want static interfaces on each address. You don’t want dynamic (DCHP) addresses for the interfaces on this system because any clients on that subnet will use the IP address of the Snort system as their gateway. For any interface that Snort will process traffic on, you need to disable LRO and GRO (there’s an explanation of this in my complete guide on installing Snort). For any interface that sends traffic to an external network, you’ll need a gateway configured. If you have multiple subnets configured off of one of those other two subnets, you would need to add a gateway for that subnet in your interfaces file, and you would need to add a static route. At this time, you should verify that you can ping hosts in every network from your Snort server, as well as external hosts via your gateway. Use the ip route commmand as well as tracepath to verify this is setup right. Do not continue until all this is working. At this point, even though the system can reach all connected networks, the system will not pass traffic between the networks. Traffic from a host on the management network can not reach any hosts on the screened network, and vice versa. This is by design. Enabling this is easy, however you may want to restrict traffic between certain networks before enabling this option, for security purposes. For simplicity, we will not enable firewall rules at this time, so if your system is a live system connected to both internal sensitive networks and public networks, you may want to read through the entire article first to understand how to add firewall rules to protect the system before enabling routing. Reboot the system. At this time, you should now be able to ping between two devices connected to different networks. 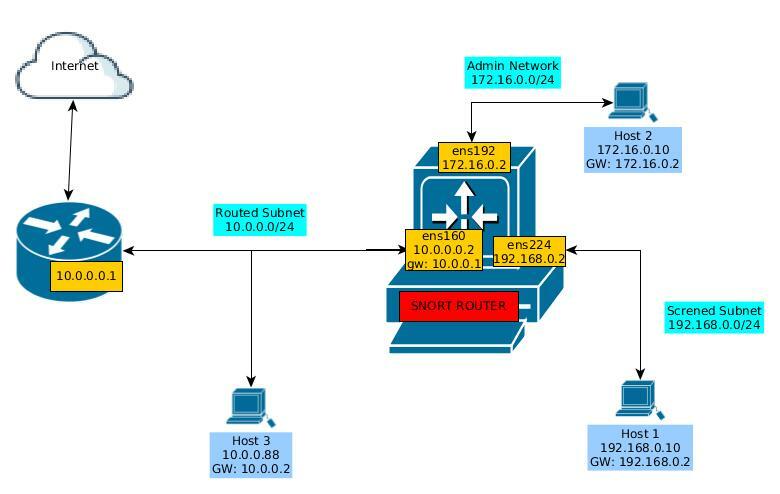 If your routing is setup correctly, you should be able to ping out the default route as well. If pinging between locally connected subnets work, but you can’t ping to external subnets, you probably need to look at the routing further down the line, do those devices have a path back to your locally connected subnets? If you have a large network, you may want to look at enabling a routing protocol on your Snort server to exchange routing information (probably OSPF or RIP, depending on you network configuration and level of comfort). If you have a Snort system up and running, you will probably need to re-compile DAQ and Snort for this guide. The reason is that to enable NFQ, you need to install libraries prior to compiling DAQ. At this point, Snort has been compiled and installed with the NFQ DAQ. Next is configuration. nfq DAQ configured to inline. If you are seeing similar output, then you’re in a good place. If not, troubleshoot the errors (usually Snort will output line number where the error was found) before continuing. -q                            Quiet. Don't show banner and status report. If you ping from one machine to another machine, you should see alerts show on your snort machine. You can’t ping to or from the snort machine directly, because this rule only looks at traffic not destined for the local machine. You have to use ctrl-c to stop snort from running after the above output. sudo sh -c "iptables-save > /etc/network/iptables.rules"
Reboot and test. You’ll need to manually re-start Snort for any traffic to be passed at this time. Remember that iptables is placing all routed traffic in NFQUEUE number 4, but if there is no application listening to that queue, traffic will not pass. you’ll want to re-save the running configuration as above (overwrite the text file), reboot, and test. Rather than try to fit a small guide for iptables on production systems into this guide, I will refer you to a couple of other excellent short guides on how to use iptables to secure your system. You should at a minimum block all access to the system (the INPUT queue) that isn’t management related or from the management network. Configuring Drop by default rather than accept is recommended. Basic iptables lock-downs for a system. More in-depth iptables lock-downs for a server. this blocks all routed traffic out the management interface. You have to insert this above the NFQUEUE rule, because once Snort permits the traffic, it does not go through other chains. If you found yourself struggling to get routing working even before you got to the Snort portion of this guide, I highly recommend that you look into taking a networking course. I personally took the Cisco CCNA course offered by the local community college (I think it was only $45 USD a unit). I learned an amazing amount about how networks work, and it made me a much better systems administrator. Don’t think that because you’re a computer administrator that Cisco training isn’t for you, it will compliment your knowledge and abilities. The CCNA official Cert Guide is what I used to pass my CCNA years ago, and are very well written textbooks. While it’s Cisco specific, most of the basic knowledge in these books are general enough to be useful to anyone working with networking. The CCNA Routing and Switching Portable Command Guide is one of the few hard-copy books I keep on my shelf and refer to whenever i’m working on Cisco eqipment. I found the O’reily Network Warior book to be quite satisfying, it gave a broad overview of a number of technologies related to network technology to really broaden my knowledge. If you’re really serious about TCP/IP, the gold standard (and really heavy) book to have is the The TCP/IP Guide: A Comprehensive, Illustrated Internet Protocols Reference. 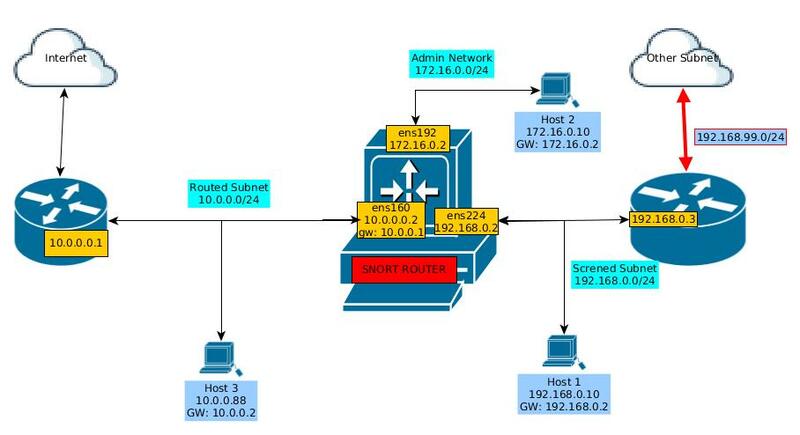 Understanding the ip route command and IP routing in Linux. Iptables Tutorial 1.2.2. If you want to know how it works at the architecture level (not the user level, and not the programming level), this is the guide you want to read. I found Chapters three through nine to be most helpful, but if you need some more info on TCP/IP, the first few chapters are quite good as well. The second flowchart at this page is awesome for understanding how packets flow through iptables. Use it in conjunction with the iptables tutorial above. the NFQUEUE options for iptables. A Deep Dive into Iptables and Netfilter Architecture, may get a little deep into the internal workings of the kernel IP stack, but I found it fascinating. Compliments this SANS article as well. I hope this article has been helpful to you. Please feel free to provide feedback, both issues you experienced and recommendations that you have. The goal of this guide was not just for you to create a Snort NIPS with NFQ, but to understand how all the parts work together, and get a deeper understanding of all the components, so that you can troubleshoot and modify your Snort NIDS with confidence.